I am the Big Bad Wolf. 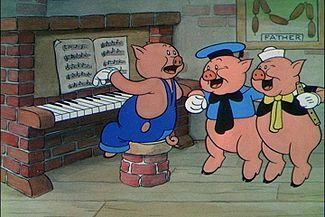 The students are some mix of the three little pigs. 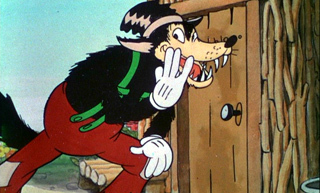 They don’t know yet that I am the Big Bad Wolf, and they are building away at their houses. However this story is a bit different because I’m going to tell them which set of houses that I’m going to attempt to demolish. If they are Fifer pig (going with Disney version FYI) and they have built their houses from straw, uh oh. If they are Fiddler pig and built their houses from sticks, uh oh. But if they are Practical pig and they spent their time and made the house out of brick while the others were out at play, then they will rejoice. I’ve been pondering the whole “grades can go down thing” with Standards Based Grading for a while now (try #1, and try #2). I want them to retain the knowledge they’ve previously gained, but I don’t want to have them thrash about thinking that there is no point in remediation. Why build a nice sand castle next to the ocean if the next wave knocks it down? So after a couple weeks of my brain (yes it is a separate entity to myself) chewing the cud; I’ve come up with a game plan. Nearer to the end of the term I will tell them a set of standards that will be under attack in a “criterion standards quiz”. These criterion grades will replace any old grades for that standard. It won’t be a large list of standards under attack, but I would be smart to choose the standards that will be useful for the next quarter. If they choose to, they can seek remediation for any of those standards that went down and they can build them back up again. The warning of the list of standards is important because I feel that many of them may have pride in their knowledge of standards, but they may not have an appropriate amount of faith in the knowledge retained. In the end, I’m looking for the students to build brick houses, and not straw or sticks like I get the feeling some of them are getting by with. I want the students to feel the need to really get a standard before they move on. Most importantly, I want the students to know when they’ve build shoddy houses, but may have gotten a good grade anyway. They need to be able to know the difference between mastery and luck. I will let you know how this Big Bad Wolf ends up with his experiment, and I hope the pigs are taking their time to build brick houses. I’m also looking for feedback on the validity of this endeavor, give me your opinions people! I also think grades should go down, but I like your idea of giving them the list ahead of time makes it more fair. I will be stealing this! Thanks for sharing!